The black Countryman B6 Windscreen is a lightweight foam windscreen designed to reduce noise from wind and breath for orators, subjects, performers, and presenters in houses of worship, interviews, television production, and live stage applications. Constructed to fit Countryman B6 lavalier microphones, it provides protection for the capsule against moisture and dirt. 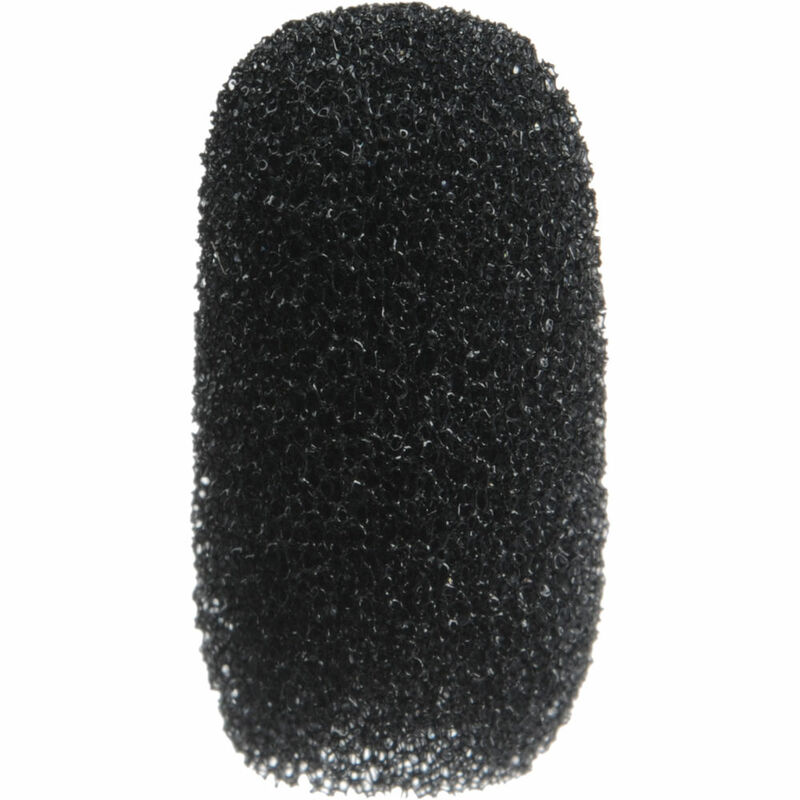 B6 Windscreen for B6 Lavalier Microphones (Black) is rated 4.4 out of 5 by 9. Rated 3 out of 5 by Camera Operator from Pretty expensive foam I love the Countryman lav mics. Much richer sounding than the Trams I had been using. Unfortunately, the peripheral accessories seem to suffer from a lack of forethought. These little foam windscreens are made to get lost. They slip over the capsule but are by no means secured to the mic. Talent will consistently rid themselves of the mic when they are done and walk away with the tiny piece of foam somewhere inside their shirt. There is no inner structure to the foam so you simply don't notice it if it falls off the mic. It simply becomes a rather large piece of lint. Rated 4 out of 5 by Filmgeek5000 from windscreen for B6 Does a real good job of battling wind noise -- the price is a bit steep for a half-an-inch of foam, but the generic brand won't fit the mic. Also be careful when removing, if you have a frequency cap on, it may get stuck inside the first few times you use it. Just gently twist to make sure the cap stays on the mic. Rated 3 out of 5 by Midwest Editor from Expensive Replacement Try not to loose your originals (hindsights is always 20/20). These are the OEM replacements, but they aren't too cheap. They are a great product for a great mic though! Rated 5 out of 5 by Scorg7 from A MUST have for outdoor recording!!! This is a great little windscreen! It's small and looks insignificant... but man alive it's absolutely necessary for recording outdoors. When I originally bought my B6 lav I tried using it outside without the windscreen attached and the mic was picking up even the slightest breeze... and in the wind the audio was unusable. After I installed the windscreen (which just easily slips over the mic head) the audio was clean. I was amazed at how this tiny windscreen filtered out so much wind! It really became a quick must have for outdoor recording! WHY HAVE A SPARE??? Once on a shoot I lost one of these little windscreens. The talent pulled the mic down through their shirt to return it to me and the windscreen must have slipped off somewhere in the process. (When I remove a lav mic I always pull the cord up through the talents shirt - or direct them to do so - to avoid this exact type of problem.) I didn't notice until a few minutes later that the windscreen was gone :( Thankfully I only had one more interview that day and it was inside. Otherwise I would have been sunk! So, yeah, it's good to have a least one spare of these little guys! Totally worth it for clean audio! Rated 5 out of 5 by Lilli from Fooling the camera With these capsules, just pick the right colour and the camera havent a chance.